Here is the list of the hotels near Gimont. Book your hotel near Gimont today, Thursday 16 May for the best price, reservation and cancellation free of charge thanks to our partner Booking.com, leader in on-line hotels reservation. Below here is the list the 50 closest hotels of Gimont, sortable according your criteria. You will find the position of these accommodations on the Gimont hotels map. Apartment Gimont Preferred hotel ! Offering a spa, Étape Gimontoise 32 is located in Gimont city center, 26 km from Auch. Free WiFi is available. Some accommodations include an equipped kitchen with kitchenware, a dining area and a living room with a seating area and a flat-screen TV. Each unit has a private bathroom with a toilet, a hairdryer and free toiletries. At Étape Gimontoise 32, breakfast and dinner trays are available upon request. Guests can enjoy the hot tub upon prior reservation. An array of activities can be enjoyed on site or in the surroundings, including cycling and hiking. Free-use bicycles are available and many shops can be found nearby. Étape Gimontoise is 25 km from Auch. The property is located 800 metres from the strain station and 40 km from Toulouse-Blagnac Airport. Villa Cahuzac is located in the 14th-century village of Gimont, in the south-west of France. A former colonial family mansion, it offers rooms with free Wi-Fi internet access. Each guest room at this Logis hotel is uniquely decorated and equipped with air conditioning, a private bathroom with Italian shower, a large wardrobe, a flat-screen TV, a desk and a phone. Hotel Villa Cahuzac’s restaurant serves gourmet cuisine and offers a range of set menus. Guests can dine in the columned gallery with views of the garden. Guests have free use of the hotel library and cooking classes are also available. Auch is 26 km from Logis Hotel Villa Cahuzac and Toulouse is 50 km away. Chez Olympe is located in Gimont and offers a garden. The property has garden views. The bed and breakfast includes a kitchenette with a microwave and a toaster, as well as a kettle. Auch is 29 km from the bed and breakfast. The nearest airport is Toulouse-Blagnac Airport, 51 km from CHEZ OLYMPE. Le Pigoennier de Larrouquet is located in Escorneboeuf and offers an outdoor pool and free access to a tennis court 1 km away. Free WiFi access is available. Featuring a shower, private bathroom also comes with free toiletries. You can enjoy garden view from the room. At Le Pigoennier de Larrouquet you will find a garden and a terrace. An array of activities can be enjoyed on site or in the surroundings, including cycling, fishing and hiking. The property offers free parking. Toulouse-Blagnac Airport is 37 km away. Set in a traditional farm from the 17th century, on the edge of the GR 653 Hiking Trail, Le Grangé offers furnished terraces and a library, just 40 km from the Toulouse. Guests are invited in the hammock in the large garden or in the communal living room. The guest house offers single beds in heated, mixed dormitories. They give access to a shared bathroom with a hairdryer. Free Wi-Fi access is provided. A continental breakfast is available every morning. Guests can also use the equipped kitchen on site or request a homemade meal made with seasonal products from the garden. The guest house is located 6 km from Gimont Train Station and from its shops. The city of Auch is 35 km away. Located in Gimont, L occitane offers a seasonal outdoor swimming pool, a garden and a barbecue. This holiday home provides accommodation with a terrace and free WiFi. This holiday home with pool views features 1 bathroom with a shower and free toiletries. The holiday home also has a well-equipped kitchen with a dishwasher, an oven and a microwave, as well as a a hair dryer. The holiday home offers a fitness centre. A children's playground is also available for guests at the property. Auch is 34 km from L occitane. The nearest airport is Toulouse-Blagnac Airport, 50 km from the accommodation. Featuring free WiFi, OH! BON PLAISIR is situated in Aubiet. Guests can make use of a bar. At the hotel, all rooms are fitted with a wardrobe and a flat-screen TV. A buffet breakfast is served each morning at the property. Auch is 20 km from OH! BON PLAISIR. Toulouse-Blagnac Airport is 59 km away. A Gers B&B, Au Pichet is located in Saint-Orens and offers a garden with flowers, ancient vegetables, aromatic and medicinal plants. Guests will also find a furnished terrace, barbecue facilities and free Wi-Fi access in all areas. Au Pichet the three rooms feature a TV and a refrigerator with a bottle of water. The private bathroom comes with a hairdryer and free toiletries. In the morning, guests can have a continental breakfast including homemade jams, cakes and fruit from the garden. They will find restaurants serving either local or gastronomic cuisine within 5 km. Hiking is possible in the surroundings and water based activities can be enjoyed 8 km away. Auch Train Station is a 30-minute drive from this property, where free private parking is possible. Located in Noilhan in the Midi-Pyrénées region, Maison de charme dans le Gers features a terrace. The holiday home has garden views and is 37 km from Auch. The holiday home is fitted with 2 bedrooms, a flat-screen TV and a fully equipped kitchen that provides guests with an oven, a microwave, a washing machine, a toaster and a fridge. Blagnac is 50 km from the holiday home. The nearest airport is Toulouse-Blagnac Airport, 51 km from Maison de charme dans le Gers. Guest accommodation Mauvezin Preferred hotel ! VVF Villages de Mauvezin du Gers offers aparthotel accommodation set in the heart a typical Gascon village. Some apartments feature a furnished terrace or a garden view and free WiFi is available in the reception. All Apartments have a seating area with a TV and a bathroom with a shower and hairdryer. Each apartment also has a fully equipped kitchenette with a dishwasher and a microwave. Toulouse-Blagnac Airport is a 45-minute drive from the property where free parking is available. Château de Clermont-Savès is a B&B located between Toulouse and Auch. Set in an 18th-century castle, classified as a historic monument, it offers a tree-filled park, an outdoor hot tub and free WiFi access in public areas. Individually decorated with period furniture, all rooms have a private bathroom with a bathtub or a shower, free toiletries, a hairdryer and a bathrobe. Some also feature a seating area and a fireplace. At Château de Clermont-Savès, guests can enjoy a continental breakfast, as well as share a meal at the owner’s table. A golf course can be found just 8 km from this B&B. L’Isle-Jourdain Train Station is a 10-minute drive away. Free private parking is possible on site. Guest accommodation Cologne Preferred hotel ! Offering an outdoor pool, seasonal outdoor pool and barbecue, Un Coin de Paradis is situated in Cologne in the Midi-Pyrénées Region, 39 km from Toulouse. The guest house has a children's playground and sun terrace, and guests can enjoy a local, homemade meal at the owner's table. Some guest rooms include views of the pool or garden. The rooms are equipped with a private bathroom. For your comfort, you will find free toiletries and a hairdryer. Un Coin de Paradis features free WiFi throughout the property. There is a cash machine near the property. Montauban is 45 km from Un Coin de Paradis, while Auch is 33 km from the property. The nearest airport is Toulouse-Blagnac Airport, 33 km from Un Coin de Paradis. Les Roulottes d’Encazeaux is 4 km from the centre of L’Isle Jourdain and 5 km from the train station. It offers a wooden caravan, an outdoor swimming pool and free Wi-Fi access in public areas. The wooden caravan is heated and features a terrace with barbecue facilities. The private bathroom is complete with a shower and free toiletries. Horses can be admired in the area. A breakfast including pastries, seasonal fruit and hot drinks can be delivered every morning to your wooden caravan. A basket with local products like cheese and duck sausages can also be delivered for dinner if you reserve in advance. Les Roulottes d’Encazeaux is 28 km from Téoula Golf Course. There is a children’s playground on site and free private parking is available nearby. La Maison Tricherie is situated in Crastes. Complimentary WiFi is offered. The holiday home is equipped with a flat-screen TV. The holiday home offers a seasonal outdoor pool. A barbecue is available for guests at La Maison Tricherie to use. Auch is 15 km from the accommodation. The nearest airport is Toulouse-Blagnac Airport, 67 km from the property. Located in Crastes, La Tricherie features accommodation with a balcony and free WiFi. The property has garden views. The holiday home is fitted with a TV and a living room. There is a seating area and a kitchen complete with a dishwasher, an oven and a microwave. The holiday home offers an outdoor pool. La Tricherie offers a barbecue. Auch is 15 km from the accommodation. The nearest airport is Toulouse-Blagnac Airport, 68 km from La Tricherie. Boasting accommodation with a terrace, La chambre la Tricherie is located in Crastes. This bed and breakfast offers free WiFi, a seasonal outdoor swimming pool, as well as barbecue facilities. The property includes a living room with a flat-screen TV. A continental breakfast can be enjoyed at the property. Guests can relax in the garden at the property. Auch is 15 km from the bed and breakfast. The nearest airport is Toulouse-Blagnac Airport, 68 km from the property. Located in Crastes, La tricherie - maison d'hotes offers 3-star accommodation with a seasonal outdoor swimming pool, barbecue facilities and a garden. Each accommodation at the 3-star guest house has garden views and free WiFi. Each room is equipped with a terrace. Guest rooms at the guest house are fitted with a seating area. At La tricherie - maison d'hotes the rooms are equipped with a desk and a flat-screen TV. You can play table tennis at the accommodation. Auch is 15 km from La tricherie - maison d'hotes. Toulouse-Blagnac Airport is 68 km away. La Bastide de Lassalle is located in the countryside in Montegut, near Auch and surrounded by fields and farms. This guest house offers rooms with a view. All the individually decorated rooms are equipped with lounge, desk and Wi-Fi internet access, 2 of which open onto a large terrace. They have tea and coffee making facilities. Guests can enjoy the surrounding park or relax in the guest house’s library or on the veranda. They can also relax in the common living room with a TV and a fireplace. La Bastide de Lassalle serves a buffet breakfast using local produce from Gascogne and home-made breads and pastries. It is served in the veranda and outside in summer time. Upon request, guests can share a meal at their owner's table. Electric cars can be charged during the night. Located in Endouffielle in the Midi-Pyrénées region, Les Gîtes d'Au Fray features accommodation with free WiFi. The units have a fully equipped kitchen with a dishwasher and an oven. A terrace with mountain views is offered in each unit. The holiday home offers an outdoor pool. A barbecue can be found at Les Gîtes d'Au Fray, along with a children's playground. Toulouse is 45 km from the accommodation, while Auch is 49 km away. Toulouse-Blagnac Airport is 45 km from the property. Situated just 200 metres from the centre of Samatan in the Gers region, Club Découverte Vacanciel Samatan offers modern guestrooms set alongside the huge Samatan lake. All the guestrooms at Club Découverte Vacanciel Samatan come with a private bathroom and a TV. Other facilities include free WiFi at reception and a laundry service. The Club restaurant serves regional cuisine and offers panoramic views of the lake from its terrace. The hotel organizes many day and evening activities including hiking trips and music nights. The Club is 50 km from Toulouse and 35 km of Auch. Free public parking is possible nearby. Logis Au Canard Gourmand is located in Samatan. It offers individually decorated rooms situated around a patio equipped with a hot tub, and free Wi-Fi connection. Each spacious and air-conditioned room is equipped with satellite channels on a flat-screen TV, and a private bathroom with an Italian shower. Au Canard Gourmand's restaurant offers gourmet cuisine centred on duck specialties and serves a hot buffet breakfast daily. Guests can enjoy a drink in the hotel bar. The hotel’s fully furnished terrace is available during summer, so guests can dine and enjoy their drinks while overlooking the garden. Free public parking is provided. It is 40 minutes from Toulouse and its airport. Activities in the area include hiking and cycling. With city views, Maison de Save is set in LʼIsle-Jourdain and has accommodation with a kitchen. The accommodation is air conditioned and is equipped with a hot tub. All units are equipped with a dishwasher, oven, a coffee machine, a microwave and kettle. There is a private bathroom with bath and free toiletries in each unit, along with a hair dryer. If you would like to discover the area, hiking is possible in the surroundings. Toulouse is 35 km from the apartment, while Auch is 45 km from the property. Toulouse-Blagnac Airport is 35 km away. Situated in the Midi-Pyrenees region, this design hotel is located at the heart of L'Isle-Jourdain town centre. It offers a bar and a gastronomic brasserie open 7 days a week. Each air-conditioned room at the L’Échappée Belle has modern decor inspired by photography and is equipped with a television and telephone. All rooms feature a private bathroom. A continental breakfast is served every morning at L’Échappée Belle. The hotel brasserie menu was created by the 2-star chef Bernard Bach. With a 24-hour front desk, free Wi-Fi access is provided throughout the hotel. Toulouse is a 30-minute drive away, and the hotel is just 850 metres from the lake.Free public parking is available nearby. Located in the heart of the Gers department, Hotel Val de Save welcomes you in a peaceful and elegant setting with a cheerful atmosphere. The hotel features comfortable rooms that are perfect for business travellers or tourists. Hotel Val de Save boasts a gourmet restaurant serving delicious local specialities. Have dinner indoors or on the terrace. The hotel features seminary and meeting rooms for business travellers. Holiday home Chateau de Montadet is located in Lombez and offers water sports facilities and a tennis court. The holiday home features an outdoor pool and free WiFi. Opening onto a terrace, the holiday home consists of a fully equipped kitchen and a TV. Holiday home Chateau de Montadet offers a barbecue. Skiing and horse riding can be enjoyed nearby. Auch is 40 km from the accommodation. The nearest airport is Toulouse-Blagnac Airport, 54 km from the property. Le Gavachon is a Gers B&B located in Leboulin and offering a garden with a terrace and an outdoor swimming pool. Guests can also enjoy free Wi-Fi available in the public areas of the main house Rooms at Le Gavachon have views over the garden or the swimming pool and include a private bathroom with a bathtub or a shower and a hairdryer. Breakfast is served daily and guests can find bars and restaurants within a 10-minute drive. There is a shared lounge. Hiking can be enjoyed in the surroundings. Located in the Gers countryside and offering an outdoor swimming pool, Chambre d'Hôtes Le Moulin d'Encor is a B&B where guests can enjoy a garden, a furnished terrace and a shared lounge. Each room at Chambre d'Hôtes Le Moulin d'Encor has air conditioning, free WiFi access and a seating area as well as a private bathroom with a hairdryer and free toiletries. Upon reservation 24 hours in advance, evening meals are available. Breakfast includes homemade marmelade and pastries and savoury items upon request. Cooking classes are available in Summer. An array of activities can be enjoyed on site or in the surroundings, including cycling, fishing and hiking. Toulouse Matabiau Train Station is located a 50-minute drive from the property. Situated in Nizas, in the Gers region, Chambres D'hotes Aux Lauriers offers a 6-person hot tub, garden and terrace. This 3-star bed and breakfast offers free WiFi. Free private parking is available on site. The units at the bed and breakfast come with a seating area. The rooms have a private bathroom with a hairdryer. A continental breakfast is served every morning at the property. Guests have access to a shared kitchen. Hiking is among the activities that guests can enjoy near Chambres D'hotes Aux Lauriers. Toulouse is 37 km from the accommodation, while Auch is 38 km away. The nearest airport is Toulouse-Blagnac Airport, 33 km from Chambres D'hotes Aux Lauriers. Guest accommodation Lombez Preferred hotel ! Residence Chateau de Barbet is a holiday park located in Lombez. It offers villas with a private garden and free WiFi access. Guests will find outdoor swimming pools and sun terraces. All villas at Residence Chateau de Barbet have a terrace and a seating area with a TV. The private bathroom comes with a bathtub. There is a fully equipped kitchen and a dining room. On site, guests can also enjoy a restaurant. A tennis court, a fitness centre, entertainment staff, and a kids' club are available in this holiday park. Toulouse Blagnac Airport is 40 km away. The property offers free parking. Holiday home Maison Fleurie is set in Lombez and offers water sports facilities and a tennis court. Free WiFi is provided. The holiday home includes a kitchen with a dishwasher and an oven, as well as a coffee machine. If you would like to discover the area, horse riding is possible in the surroundings. Auch is 43 km from the holiday home, while Muret is 44 km from the property. Toulouse-Blagnac Airport is 58 km away. Set in an old farmhouse building in the Midi-Pyrenees countryside, this bed and breakfast is just 2 km from Maubec village. It features an outdoor swimming pool in the garden. Guest rooms at the Jardin D'en Naoua are individually decorated and some feature exposed beams. Some of the rooms feature a seating area and a private entrance. All rooms have a private bathroom. Each morning, a buffet breakfast is served in the dining room. There are barbecue facilities available, and guests can dine on the terrace. With free private parking on site, the Jardin D'en Naoua bed and breakfast is located a 50-minute drive from Toulouse. With a seasonal outdoor swimming pool and barbecue facilities, La roulotte des Mousquetaires is set in Mirepoix and provides free WiFi. Each of the units consists of a living room with a flat-screen TV, a well-equipped kitchenette, and a private bathroom with shower. A terrace with garden views is offered in every unit. A continental breakfast is available each morning at the property. The bed and breakfast offers a children's playground. A bicycle rental service is available at La roulotte des Mousquetaires. Auch is 19 km from the accommodation, while Condom is 48 km away. Agen La Garenne Airport is 65 km from the property. Located in Lombez with views of the Pyrénées Mountains, Chambres d’Hotes Au Chien Bleu offers an outdoor swimming pool, garden and terrace. Auch is 38 km away. All rooms feature a view of the garden, pool and mountains, a seating area, flat-screen TV, wardrobe, desk and heating. The en suite bathroom includes free toiletries. A breakfast is provided each morning at Chambres d’Hotes Au Chien Bleu. Guests can also sample family cooking in a meal prepared by the host, upon request. Hiking trails begin in the town and kayaking and canoeing activities can be found in the area. The Save Valleys are 9 km away and Toulouse is a 50-minute drive from the property. This hotel is located in the heart of Gascony. It offers 11 chalets and a wooden caravan with furnished terrace and garden, an outdoor swimming pool with solarium and views of the Gers Valley. Each chalet of Les Chalets des Mousquetaires has 2 bedrooms and a fully equipped kitchen including a dining area with bay windows. Guests can relax in their lounge area or on deckchairs in the garden. Bed linen and towels are provided. Mousquetaires also has a children’s play ground, and a library. There are many activities for guests to enjoy such as volleyball, and a games room with table tennis, and a billiard table. Chalets des Mousquetaires has free private parking. It is 70 km from Toulouse including the Toulouse airport and train station and 90 km from Lourdes. Featuring a seasonal outdoor pool, hot tub and sauna, Residence de Nareoux is located at the Domaine le Castagné in Auch. The property is 5 km from the centre of Auch, in the countryside of Gers. Free WiFi is available. Free private parking is offered on site. The accommodation has a seating area. Some units have a dining area and/or terrace. There is a kitchenette, equipped with a microwave. A fridge is also provided, as well as a coffee machine and a kettle. Bed linen is offered. Guests have free access to mini golf. The area is popular for fishing and hiking. Condom is 50 km from the property. Agen La Garenne Airport is 70 km away. Featuring an outdoor swimming pool, the Domaine Le Castagné B&B is located just 3km from Auch city centre, in the Gascony countryside with a view of the château and Pyrénées Mountains. There is also a lake, and a spa with a sauna, and a hot tub. All the rooms at Le Castagné are individually decorated and have en suite facilities, a flat-screen TV, a minibar and tea and coffee making facilities. Free WiFi access is available and breakfast is provided. This bed and breakfast also has games room and a children's playground. Guests can visit Auch Cathedral and the historic town centre on the River Gers, 4.5 kilometres away. Free parking is available on site. Providing a seasonal outdoor swimming pool, Holiday Home Le Fiouzaire features accommodation in LʼIsle-Jourdain. Free WiFi is provided. Certain units are equipped with air conditioning, a TV, washing machine and a coffee machine, completed with a kitchen. The holiday home offers a terrace. Toulouse is 39 km from Holiday Home Le Fiouzaire. The nearest airport is Toulouse-Blagnac Airport, 39 km from the property. The Campanile Hotel Auch is situated 3 km from the city centre and features low-cost accommodation near the industrial park in northern Auch. A TV is provided in each room and guests can also enjoy the hotel's WiFi + service: free broadband WiFi throughout the property. All of the contemporary rooms have a balcony and a telephone. The en suite bathrooms are fitted with a bath and a shower. You can enjoy meals from the all-you-can-eat buffets in the hotel’s restaurant. You will find traditional, regional and family-style cuisine available for breakfast, lunch and dinner. Located in Monfort in the Midi-Pyrénées region, maison Joie de Vivre has a garden. Guests have access to free WiFi. The holiday home comes with 3 bedrooms and a fully fitted kitchen with a dishwasher and an oven. A TV and a DVD player are available. The holiday home offers an outdoor pool. The property has a terrace, along with a water sports facilities. Auch is 37 km from maison Joie de Vivre. The nearest airport is Agen La Garenne Airport, 57 km from the accommodation. Situated in Auch, in the Gascogne region, this former farmhouse is set in the heart of the French countryside. It offers a heated, outdoor swimming pool. Guest rooms at Le Domaine de Baulieu are contemporary in style. Modern facilities include a flat-screen TV, free Wi-Fi access and air conditioning. Some of the rooms feature a private terrace. 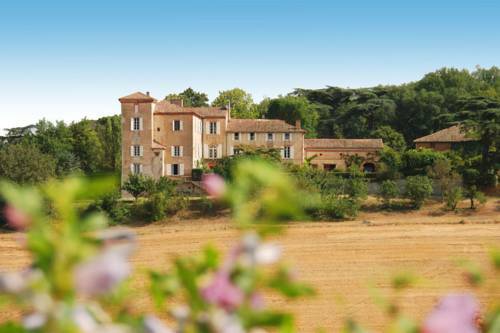 Le Domaine de Baulieu is just a 5-minute drive from Auch city centre, and 2 km from the train station. Free private parking is available on site. The relaxation area can be privatised upon reservation. Situated in Seysses-Savès, Maison En Cramaillan has a seasonal outdoor swimming pool, garden and free WiFi. Staff on site can arrange airport transfers. All rooms have a private bathroom with a bath or shower and free toiletries. Breakfast is available every morning, and includes continental and American options. Toulouse is 41 km from the guest house, while Blagnac is 41 km away. Toulouse-Blagnac Airport is 41 km from the property. Offering an outdoor swimming pool, Domaine de Poudos is located in the Gers' countryside. This B&B offers a garden and a terrace. Inside, guests can relax in the living room with a fireplace. They can use the common kitchen, with a fridge and a microwave. Free Wi-Fi is available in the property, while free parking is possible on site. In Domaine de Poudos, all rooms enjoy a view on the garden. Some have a seating area with a sofa and a kitchenette. They all have a private bathroom with toilets and shower. Upon prior reservation, guests can share a meal with the owners, based on local cooking and made with the garden’s vegetables. A continental breakfast prepared with homemade products is served in the veranda. 8 km away from the property is the old city Centre of Auch, as well as various stores and the town’s train station. Horse riding is possible 5 km away from the property. In the surroundings are the Gers’ fortified cities and castles. Offering a heated outdoor swimming pool, Domaine de Peyloubère is a B&B set in the heart of a 35-acre estate of gardens, woodland and lakes and located a 10-minute drive from Auch. Guests can relax in the spa with a sauna and jet shower. There is also a sun terrace. At Domaine de Peyloubère, the suites have a seating and dining area, tea and coffee-making facilities, a refrigerator and free WiFi internet access. The private bathroom offers a bidet and hairdryer. Breakfast is served daily, evening meals are available on request and guests can find restaurants 6km away in Auch. A shady garden, table tennis, badminton and fishing can be enjoyed on site, as well as bicycling and hiking in the surroundings. Peyloubère, once the home of the Italian painter, Mario Cavaglieri, features frescoed ceilings and painted cupboards in the Cavaglieri Suite. The property is 7.9 km from Auch-Embats Golf Club. Toulouse-Blagnac Airport is 62 km away. Featuring accommodation with a terrace, Aux Deux Mariols is located in Montadet. This villa also features free WiFi. The villa comes with 4 bedrooms, a TV and a fully equipped kitchen that provides guests with a dishwasher, an oven, a washing machine, a microwave and a fridge. The villa offers an outdoor pool. Guests at Aux Deux Mariols can enjoy tennis on site, or horse riding in the surroundings. Auch is 44 km from the accommodation, while Muret is 46 km away. The nearest airport is Toulouse-Blagnac Airport, 59 km from the property. Featuring a seasonal outdoor swimming pool, Un Air de Famille offers accommodation in Goas with free WiFi and pool views. Guests staying at this holiday home have access to a terrace. The 6-bedroom holiday home is equipped with a living room with flat-screen TV, and a fully equipped kitchen with dishwasher. The property also has 1 bathroom with free toiletries. The holiday home offers a hot tub. A children's playground is available for guests to use at Un Air de Famille. Montauban is 49 km from the accommodation, while Auch is 48 km away. The nearest airport is Toulouse-Blagnac Airport, 47 km from Un Air de Famille. Located a 10-minute drive from the centre of Auch, ibis auch is a hotel offering a 24-hour front desk, a bar and a terrace. Other facilities include luggage storage and free Wi-Fi access. At ibis auch, the rooms are air-conditioned and feature a TV. Guests will also enjoy a private bathroom with a shower and a hairdryer. The hotel provides business facilities, as well as a restaurant. A buffet breakfast composed of sweet and savoury dishes such as eggs, fruit salad, yogurts and juices is served every day. Pastries baked on site and fresh French Madeleine cakes are also on offer, as well as a hot beverage and a piece of fruit to take away. Outside of regular breakfast hours guests can also enjoy a lighter option, available from 04:00. ibis auch hotel is situated 1.6 km from Parc du Couloumé and is a 9-minute drive from a golf course. Auch Train Station is 2.5 km from this property where free parking is possible. Located in Auch town centre, a 5-minute walk from Auch Train Station, Le Relais de Gascogne has 24-hour front desk, air conditioned bedrooms, free Wi-Fi, a restaurant and a bar. Rooms here will provide you with a flat-screen TV. Featuring a hairdryer, private bathrooms also come with free toiletries. The buffet restaurant serves Asian food. A buffet breakfast is served in the morning and the hotel features a covered terrace. Set a 10-minute drive from Auch Golf Course and free parking is available at the train station. Below here is the hotels map of Gimont. Names and details of Gimont hotels can be shown on the map clicking on the prices icons.